At the heart of Graham’s Vintage Ports are the wines from the company’s famed Quinta dos Malvedos. 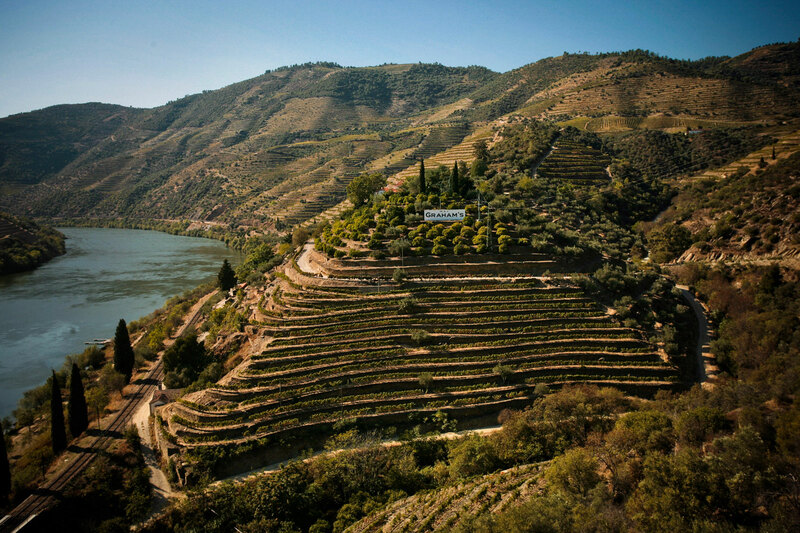 Acquired in 1890, it is acknowledged to be one of the Upper Douro’s finest vineyards. Quinta dos Malvedos is situated in the Upper Douro region near Tua, between Pinhão and the Valeira dam, on the north bank of the Douro River, in an area known for its consistent climate. Its vineyards are predominately south facing, ensuring prolonged exposure to the sun and excellent ripening of the grapes, though the undulations of the hills and valley create a range of microclimates and exposures. Altitudes run from 130 metres near the river front up to 350 metres and the soil’s main component is schist. Due to its south-facing exposure, its perfect altitude for ripening grapes and an ideal position by the Douro River, this vineyard produces full-bodied wines that are rich and very complex. The floral characteristics are of eucalyptus and mint with soft violet overtones when young. In virtually every year full ripeness is achieved, giving fine Baumé readings and consequently the classic Graham’s richness. This is balanced by well-structured tannins from the Tinta Roriz, and fine body and structure from the Barroca. The rich complexity of the Malvedos wines has been a defining characteristic of the best Graham’s Ports for over 100 years and are the origin of some of the greatest Vintage Ports ever made. Malvedos wines are at the heart of every Graham’s Vintage Port declared, and in the intervening years this property is able to produce a wonderful Quinta Vintage Port. This is bottled and then laid down to age in Graham’s own cellars in Vila Nova de Gaia and not released until ready to enjoy, usually around ten years after harvest. The Malvedos winery has 3 methods of fermentation in one building, making it one of the most versatile wineries in the entire Douro region. There is but one single-minded objective here – to produce the very finest Port possible. The Malvedos winery was refurbished in readiness for the 2000 Vintage with the installation of 3 modern lagares. During harvest the winery receives grapes from both Malvedos and nearby Quinta do Tua. The house at Malvedos has one of the finest locations of all Douro quintas, with a breath-taking view of the Douro from the tranquility of the veranda. Just to the east of the house are the famous Port Arthur stone walled terraces, so called as their shape was reminiscent of a heavily fortified city of that name which was in the news in the years just after the quinta was acquired. They are among the most striking and best preserved in the Douro, with beautiful integral stairways; superb examples of the stone mason’s art.